Not sure about the Elizabeth area, I don't think there are many friendly spots in which to shoot (tough neighborhoods, tall fences, police/security patrols, etc.). Browns Yard is accessible, located on Bordentown Ave. at Jernee Mill Rd. in Sayreville, but I would suggest shooting only from the parking lot; do not enter the yard at all. The steel plant job will run along Jernee Mill Rd. just out of the yard, but I am not sure when it's called (late afternoon or evening I think). These units would arrive & depart on the Oak Island transfer jobs, so a lower Chemical Coast sighting is possible as well, safely done in the Port Reading area. Not sure about the Elizabeth area, I don't think there are many friendly spots in which to shoot (tough neighborhoods, tall fences, police/security patrols, etc.). Oh, tell me about it. 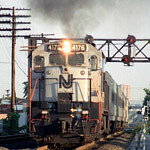 I went to Sacred Heart Grammer School right there near the CNJ mainline where it crosses Rt 1/9. That - was a TOUGH neighborhood. I used to scramble up the embankment and watch the RS3's (always my fave) go by. I even frequented the old E'port platforms with a camera in one hand, tire iron in the other, until you couldn't go up there anymore. This was LONG after passenger service was gone. Those were good times. I used to be able to shoot near Trumball by the NJTurnpike but i've not been down there in years. I miss the "old" Elizabeth. I'll take a cruise and see what's still accessable. I'll find the SD-50's. But I definitely will go to Brown's, I've not been there yet and i'm very curious to scout it. You guys must have awakened the Browns Yard gods for everything fell right into place for me to catch all three of the late afternoon trains in/out of the Yard. Keep an eye open for a major tie replacement project to begin next month in the Browns Yard vicinity. A CSX geep with the funky new logo, rail ties, ballast cars, and OI16 has just arrived. Finally caught a ballast train in operation. Cool shot, Jason, nice to see 5313 back in this area; she had been assigned to CSAO South Jersey for awhile. 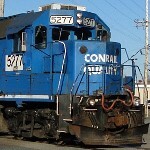 bigblue5277 wrote: Keep an eye open for a major tie replacement project to begin next month in the Browns Yard vicinity. And so it begins. I just shot a work train carrying MofW equipment heading for Browns Yard. The symbol was OI-82 with NS 2584 and NS 5309. He was through Port Reading at 10:20am and should be close to Browns now. Erie Limited wrote: And so it begins. I just shot a work train carrying MofW equipment heading for Browns Yard. Thanks for posting this. I went yesterday afternoon to check out the yard. The train was off on a siding just west of Browns Rd. NS 2584 and NS 5309 were at the tail end of the train facing the other way. They must have turned around on the Sayreville wye. I thought NS 2584 and NS 5309 would have went back last night when the OI-16 locos return to Oak Island, but they are still sitting at Browns this morning. Browns Yard is booming with activity this morning. - Browns Rd. RxR is closed w/ loads of equipment and man power at the sight. They are using cranes to install a large section of track. - MofW equipment also at work in the yard and to the west of the yard. The MofW equipment train that came down on Sunday was emptied yesterday and left the yard last night along with NS 2584 and NS 5309. Here's a few pictures from this out of the ordinary week at Browns. Thanks for sharing. Nice pan shot of the spiker! Not familiar with this area but noticed a remnant in your photo....the foundations of a signal bridge. How long ago was it dismantled ? Track work going on at the east end of Brown Yard as late as 6 pm.